The GROHE Allure Brilliant floorstanding bath filler plus hand shower – luxury and angular modern design! Cool minimalism meets cutting edge technology! With a sophisticated faceted design that exudes architectural appeal, the impressive floorstanding GROHE Allure Brilliant bath mixer creates a dramatic style statement in any contemporary bathroom. 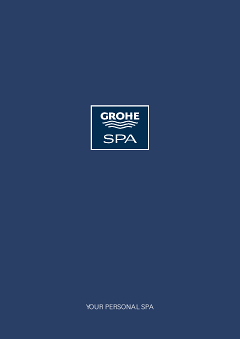 Packed with GROHE’s innovative technology, it is also a delight to use and offers a new level of bathroom luxury. The tap is perfect for filling a freestanding bath and the GROHE SilkMove ceramic cartridge guarantees the control of water volume and temperature is smooth and precise. The scratch resistant GROHE StarLight chrome finish has a sparkle that lasts for years and the Euphoria Cube+ stick handshower with 1250mm metal hose makes washing and rinsing your hair a real pleasure. You can easily switch between the two with the diverter. GROHE DreamSpray ensures the flow of water from every nozzle of the handshower is lovely and even and the handy silicone SpeedClean nozzles are easy to keep free of dirt and limescale! GROHE EcoJoy limits water flow to 9.5 l/min, which saves water and money without compromising performance, and. Install with our rough-in set (45984001). GROHE Allure Brilliant – a blend of craftsmanship and bathroom style. The GROHE DreamSpray® technology turns your daily shower into a luxuriously relaxing experience. The advanced engineering of the shower head ensures a balanced flow of water from all nozzles, whatever spray pattern you choose. GROHE EcoJoy® provides all the comfort you would expect of a GROHE shower while reducing your water consumption by up to 40%. This water-saving technology not only has a positive environmental impact, but will help to reduce your household bill, too. Versatile and revitalising, GROHE’s Normal Spray guarantees showering satisfaction every day of the year. A strong insulation of the water guide inside the shower prevents its surface from heating up, so it will never be too hot for you to touch. At the same time, this serves to protect the chrome finish of your GROHE shower, further enhancing its great durability.